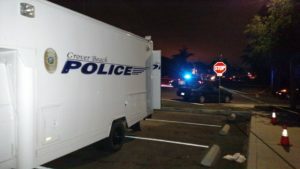 Officers shot and killed a man Wednesday night who charged at them with a blunt object, according to the Grover Beach Police Department. Shortly after 10 p.m., police received a report of a disturbance outside a home in the 1000 block of Brighton Avenue. Two Grover Beach officers arrived at the scene within minutes and found a man armed with a blunt object in front of the home. Upon the officers’ arrival, the suspect immediately became argumentative and was combative toward them, police said. The officers tried to calm the suspect, and they asked him to drop his weapon. But, the suspect refused and then threatened the officers while walking toward him, police said. The officers deployed a Taser, which had no effect on the suspect. The man continued to threaten the officers and charged toward them with the weapon in a threatening manner and officers shot the man, police said. Neither of the officers suffered injuries during the incident. Both have been placed on paid administrative leave pending an investigation by the county district attorney’s office. One of the policemen was a sergeant with more than 15 years of service. The other was an officer with less than one year of service. Police are withholding the identities of the officers and the deceased man until an investigation has been conducted and relatives have been notified. Hey Calcoast News can you dig a little deeper for us, in order to better assess whether or not this was an appropriate action by the police dept.? A blunt object can mean a lot of different things to many people. It was listed as the basis for causing such great concern and fear by the police, but what was it? A blunt object could be; a fat doobie, a can of spray paint, a candlestick, a brick, an iron, a lawn ornament….lot’s of things is the point. Some blunt objects should be feared, while others not so much. So what was it? Usually blunt objects lose their deadly force the further you are away from them. In response to their fear could they not have retreated –but contain an area–and deescalate? What was it about this blunt object that required such immediate and overwhelming response? Again, some blunt objects afford one the time to deescalate, while others may not. Knowing what the blunt object was should of some importance in this matter, should it not? They ordered him to surrender, they tazed him with no effect. Doesn’t leave a lot of options when he still comes at you. That’s why cops carry guns. Many businesses pay performance bonuses to employees who take initiatives that save the company money. These officers work for the taxpayers and they saved us a helluva lot of money at $50,000/yr in incarceration costs, then probation officers salaries, then incarceration costs, then probation officers salaries, then incarceration costs…….. I say performance bonuses for both! Public perception about taser’s is very much misguided, they are only effective about 65% of the time!!! It’s seems that picking the right recruits, that have the personality to handle these type of situations, should be the most important part of the Police hiring process!!! Given a consistent track record of lies and exaggerations by local law enforcement agancies, more facts are required in this case. People are imitating those zombie shows. Not a good idea when combined with police who look for cooperation from people with a toehold on reality. It really sounds like the officers gave this man options. Tased him first before pulling a weapon and firing. His choice was to deny himself any chance. Lots of details still not mentioned. Did the taser operate properly, did it attach properly? “the suspect refused and then threatened the officers while walking toward him”, so the police approached him? Was he a danger to someone else in the area? Why approach him? Lets hope the investigation is in a timely manner. NEVER, EVER, should there be a question when a law enforcement official is challenged with a dysfunctional opponent (anger, drugs, mental, criminal) think twice about his life or the suspect. Push comes to shove, we all need law enforcement officials more then we need another violent predator on our streets. Granted, it should be a last result but most of the incidents happen within minutes and every second counts. I have never understood when a law enforcement official says hands, or knee, or walk backwards you would not comply. Insane to say the least!